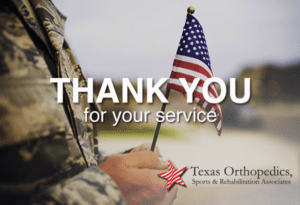 Texas Orthopedics salutes all active men and women currently serving our country on this Veterans Day, as well as those who are retired and have past served. It has been our privilege to know and treat a great number of patients over the years who have bravely responded to the call of duty. In addition, we are proud to have several ex-military members in our office, including some of our fellowship-trained and board-certified orthopedic surgeons as well as supporting staff. Veterans Day officially dates back to 1919 and was formerly known as Armistice Day to mark the end of World War One. There are currently 16.1 million veterans still living who served in at least one war and another 5.2 million who served during times of peace (History.com). Please join us in thanking these men and women for their sacrifice and selfless duty to our nation. Happy Veterans Day!